Spring Harvest: I have engineered at Spring Harvest five times in the last seven years. This large Christian event runs over three weeks at Butlins. 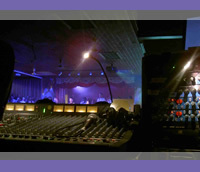 My role has usually been as combined FOH / monitor engineer in the challenging 800 capacity alternate worship venue with a mix of bands and music styles. Pinewood Film Studios: Part of the 75th birthday celebration of the studios was a star studied garden party including an outdoor stage with live music. As lead engineer on site, I was responsible for installing and setting up the Meyer Sound PA rig and engineering the live acts. The Clothes Show Live: This is one of the world's largest fashion events. Sub-contracting to Image Innovations I have engineered sound on the designer catwalk on a number of occasions. I have also worked with them on other events including London Fashion Week and The Good Food Show. 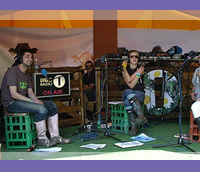 Glastonbury Festival 2005: Working for SSE, I was on site as front of house engineer at "The Glade" which is the large outdoor dance stage, and also provided technical cover for SSE at the BBC Radio One live studio; this was a welcome relief to the knee deep mud at the Glade! Greenbelt Stage Two: My return to the Greenbelt Festival after 13 years saw me in the role of lead sound engineer on Stage Two. This is the exceptionally loud rock venue; up to fifteen bands a day play it. Each has a 45min set with 15min turn around time. I spent most of my time engineering monitors. 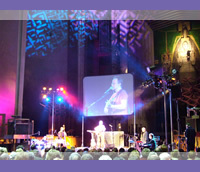 Graham Kendrick: For two years in a row I was head of video for Graham's Cathedrals Tour. The system included one or two large screens plus assorted in fill monitors to help with the poor sight lines in many of the venues. We had feeds from cameras, two PC's and DVD. With over 20 years of experience of sound, lighting and AV for events, Mike is an experienced sound engineer and all round audio-visual technician. He has worked both within the UK and worldwide on a wide variety of events. Live sound: Primarily a front of house engineer, Mike is also at home on the monitor desk. He has engineered everything from rock bands to folk & jazz, in festival and club settings, international conferences & worship events. He is easy to work with, highly flexible, and will help bring the sound you want to your audience. Video: Over the years Mike has worked on a wide variety of AV projects in venues ranging from the Royal Albert Hall to hotel conference facilities. Mike is available for vision mixing, PPT and camera operation. He has good person to person skills, so is ideal in conference settings where close working with professional clients is needed. 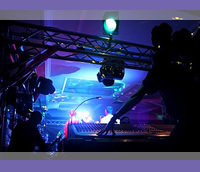 Lighting: Mike is available for rigging and operation of conventional and moving lighting systems. He has current IPAF (powered access) & PASMA (access towers) cards and is insured to work at high level. Production Services Association: Membership # 1533. PASMA trained & certified: Certificate # 138611. IPAF powered access: License # OP/0266350. Public liability insurance up to £5m including work at heights. 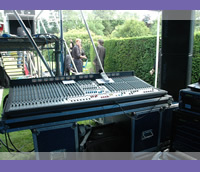 Mike is available for booking as a freelance engineer direct though MG Event & Sound. Mike provided such excellent quality service that our clients specifically request his services for their events in the future!